Today is 10th February and I have managed to run 10 days in a row. Another 18 days to complete the 28 days challenge run. The list above is for the TMBT 100km Ultra Trail Participants which will be held on 14th September 2013 somewhere in Sabah. The only runner I don’t know are Fadhullah Awang and William Kok. The rest are my friends. Ahmad Fathi Junaidi is the super runner. 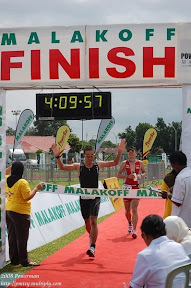 Md Sukairi and Rosli Tajuddin, both of them are the experience trail runners.